What is the best way to learn German? Well, I think it’s by using content you enjoy. 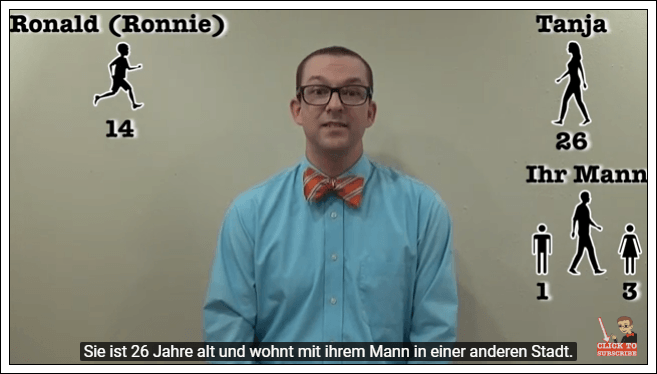 For example, imagine how much more fun you’d have learning German by watching videos. This could be reality for you, depending on how much you’re motivated to learn. Video content can be a fantastic way to study German – and in this article we’ll show you exactly how. There are literally thousands of very kind people out there who have made and released video content for learners of German. The content tends to be skewed toward beginner learners, but there are a couple of tips to be found at higher levels too. Here’s one of my favorite pronunciation breakdowns that explains all the German sounds in a clear and organized way. And here is a playlist for intermediate learners focused on using the language to accomplish different communicative needs. Lots of people are studying German in order to pass some kind of exam. Whether that’s one of the telc tests or the TestDAF or something else entirely, there are some great videos about what you can expect to encounter on test day. If you’re studying for an exam, the best way to keep your head in German is to watch videos that keep English to a minimum. That’s why right here we’ve got two great channels with no English at all. Deutsch mit Marija is a great channel conducted entirely in German about strategies for the Goethe Institut exams all the way up to C2. And here’s another channel called Easy Speaking with Nataliya with a lot of tips specifically for another test format, the TestDAF. If the world of German video content is a water park, the videos for learners are the kiddy pool. It’s time for the water slide of interesting stuff all in German, made for people who don’t need to be spoon-fed anymore. Moving away from YouTube, one fantastic type of resource is German TV channels. MDR and ZDF are two phenomenal broadcasting companies that not only release all kinds of fiction and nonfiction shows for free online, they give them all subtitles in German. Reading along with German subtitles is a total game-changer for your German learning. It keeps you immersed in the content, it improves your reading speed and phonetic decoding of the written word, and it gives you something to help you understand without resorting to English translation. The biggest thing is that you need to enjoy what you’re watching. I once suffered through weeks of terrible German stand up routines because for some reason I was caught up on the idea that I needed to consume that specific type of language, and that giving up was a sign I wasn’t a good learner. But nothing could be further from the truth. I should have dropped those videos the first time someone told a joke that fell flat (there were many, let me tell you) and simply looked for something else. Since then I’ve watched dubbed Swedish police dramas, unboxing videos, camera reviews, documentaries on bugs, and makeup tutorials – because there is literally no limit to the kind of German content you can find online. Not only that, but you can import your favorite German content into LingQ. LingQ will turn your favorite videos into interactive lessons by allowing you to easily read the video’s transcript, look up words, and create flashcards. As you can see with the screenshot above, LingQ makes it easier for you to read German and look up new words. You can also listen to the audio as you go along. You can import any video from YouTube into LingQ, as long as there are closed captions. You can also import content from MDR too, using the same method you would use for YouTube. All you need is the LingQ extension and you’re good to go. For a complete guide about importing, please check out this post here. For more information on learning German, Steve Kaufmann has written about his own experience which you can find on his blog, here. Good luck. Author Bio: Alex Thomas has a near-encyclopedic memory for German videos on YouTube ever since he learned that he would get better grades in class if he switched his binge watching to German. He only wishes that memory would apply to the German language itself.